Just in from the plant exchange today is this lovely spiderwort, Tradescantia. It’s so pretty! I get about twenty points for this exchange — ten for each type of plant. My mondarda (bee balm) and stachys (lambs ear “Big ears”) really needed some breathing room. They were both creeping over to areas where I wanted emptiness. When we moved into this house, I planned rather early to slowly eliminate the amount of mowable grassy lawn, so plant exchanges fit very nicely into my plan. I had been shopping the clearance and year-end sales at garden centers before 2008 (when I joined my plant exchange group). Exchanges have a little more fun for me in that I can talk garden with gardening peers rather than corporate staffers. 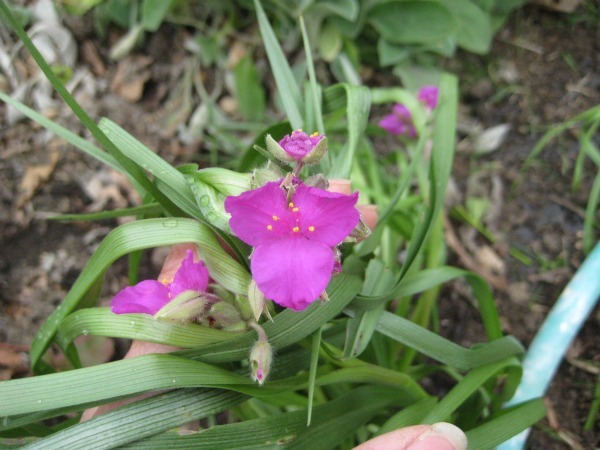 Spider wort -- I'm holding it up to firm the dirt around it. See the garden hose in the background? Christel and I had scheduling challenges for this exchange, but it all worked out. She was very generous with her gift. To learn more about plant exchanges, you can read my article over at the Des Moines Frugal Family Examiner page. This entry was posted in frugal family and tagged garden, perennials, plant exchange. Bookmark the permalink.